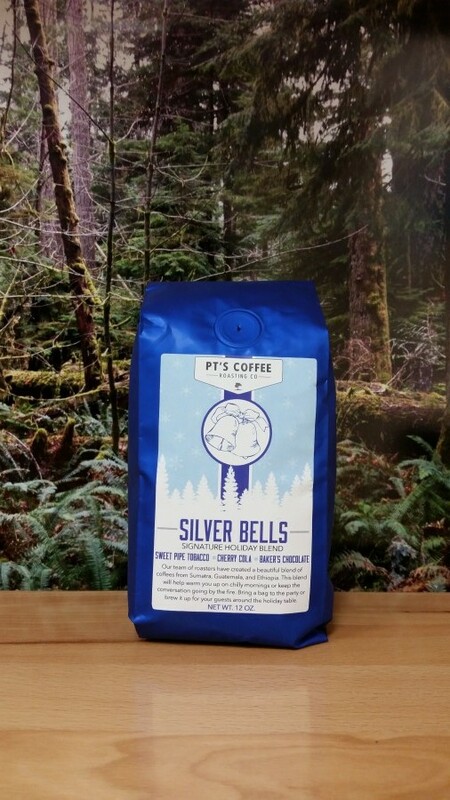 PT's Coffee Roasting Co. gives us Spicy, Full Bodied & Bright with their seasonal offering, Silver Bells! The first whiffs of the grounds are fruity sweet and earthy spice. On breaking the crust this deepens into more detailed notes of bright herbs, brown sugar and molasses. Full bodied and round, we find it a little silty at the edges of the tongue. The acidity ranges from tart tropical to lemony citrus, but is delicate enough that it's shortly overtaken by other aspects of flavor. The sweetness reminds us of light caramel and berries with an interesting sweet jalapeño tone coming through. The complexity is rich like pipe tobacco and molasses. In the finish the brightness fades leaving dry cocoa and bittermelon. Aromatically this coffee presents a rich sweetness of malt with hints of herbs. The texture is full bodied, round and coating, with some roughness here and there. The flavors open with a balanced tart citrus, accented with muted berry sweetness. Sweet malt tones bridge into low cocoa and herbaceous spices. The linger is long and earthy with dry spices and notes of bittersweet chocolate. Our experience of this coffee was: Spicy - Full Bodied - Bright. Categories: Coffee Ratings. Origins: Blend. Flavors: Berry, Bittermelon, Citrus, Cocoa, Delicate, Earthy, Full, Herbs, Light Caramel, Molasses, Pipe Tobacco, Round, Silty, Spicy, Sweet Jalapeño, Tannins, Tart, and Tropical. Brew Descriptors: Bright, Full, and Spicy. Roasters: PT's Coffee Roasting Co..